Combine all ingredients together and mix well. Season to taste. Coat frozen crab cake with flour, then dip with egg wash and lastly, breadcrumb. Deep fry the crab cake at temperature 170-180°C until golden brown. Drain off oil. Placed on a paper towel. Pulse the fish and prawns in a processor until become a smooth paste. Add in the lime leaves, chili, the sautéed mixture, salt and pepper. Mix until even. Transfer to a mixing bowl. Prepare a hot pan with oil. 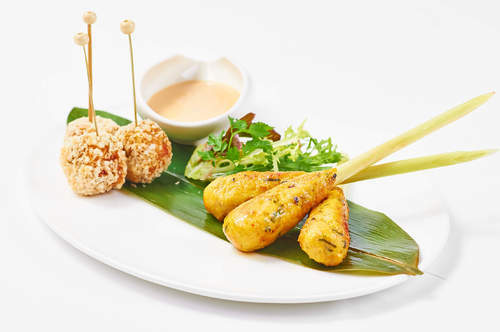 Prepare the skewers – roughly 30g of the mixture around the thick end of each lemongrass stem. Press firmly until it has a cone shape. Grill it on the pan with moderate heat until it has a golden brown colour and cooked. Slice the ginger, garlic and red chili. Heat the oil in a small pan. Add the mixture and sauté until it is fragrant and lightly brownish. Stir frequently until it dried up. Add the turmeric powder and stir for another 2-3 minutes. Transfer to a bowl to let it cool. To add in the fish and prawn paste. Boil the milk, pour in the tea leaves. Hold it at 85°C for 10 minutes. Strain the milk through a fine sieve. Use a smaller ladle and press the tea leaves dry to get most of the milk infusion. Put the garlic, sherry vinegar and milk infusion to a blender. Switch on the blender and slowly pour in the oil until it is emulsified. Season to taste. Refresh the lettuce with ice water. Strain the water, let it dry on paper towel. Prepare a white rectangular plate. Line with a bamboo leaf. Arrange the salad bouquet in the middle of the plate. Place three crab cake on the side with cocktail pick or skewer. Place the seafood skewer on the left side of the plate. Use a small cup to put the Earl Grey dip and put it on the side of the plate.